I am loving the cooler temperatures and "nip" in the air. Before long the leaves will start turning and everything will be going to "sleep" for the winter. Recently, I was staying at home and decided to pull out an old chair that I bought at a flea market a few years ago. I bought the chair for $5. Even at just $5, my husband thought I was nuts. (haha) I have to admit, it was in pretty bad shape. 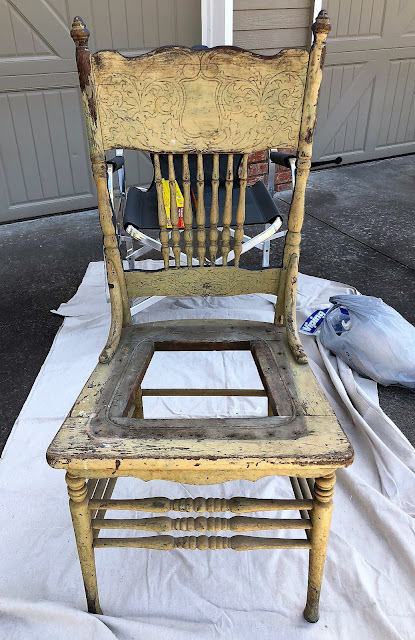 But, when I looked at it, I could imagine it's place at a family table at one time and the many holidays, celebrations or simple family dinners this chair had been a part of. It seemed so sad to me that this chair ended up in a flea market with just a $5 tag on it. (Kind of like seeing someone's old family photographs in a flea market). But now, I was not imagining this as a chair anymore but more as a decorative little table or plant stand. So, I cleaned the chair up as best I could and pulled out my paint brushes, rags, and DecoArt Chalk Paints, Stencils and paint brushes. 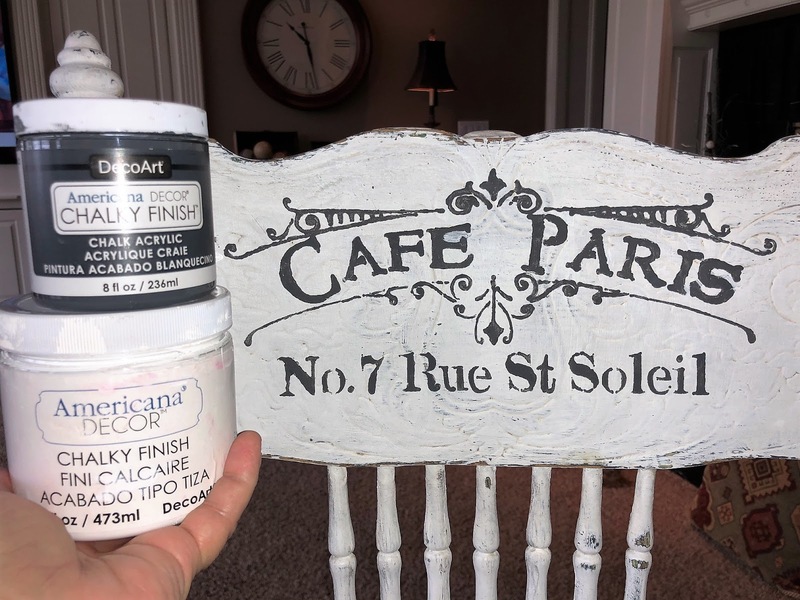 I first gave the chair a coat of DecoArt Americana Decor Relique Chalk Paint. It's a dark grey color and I love it. 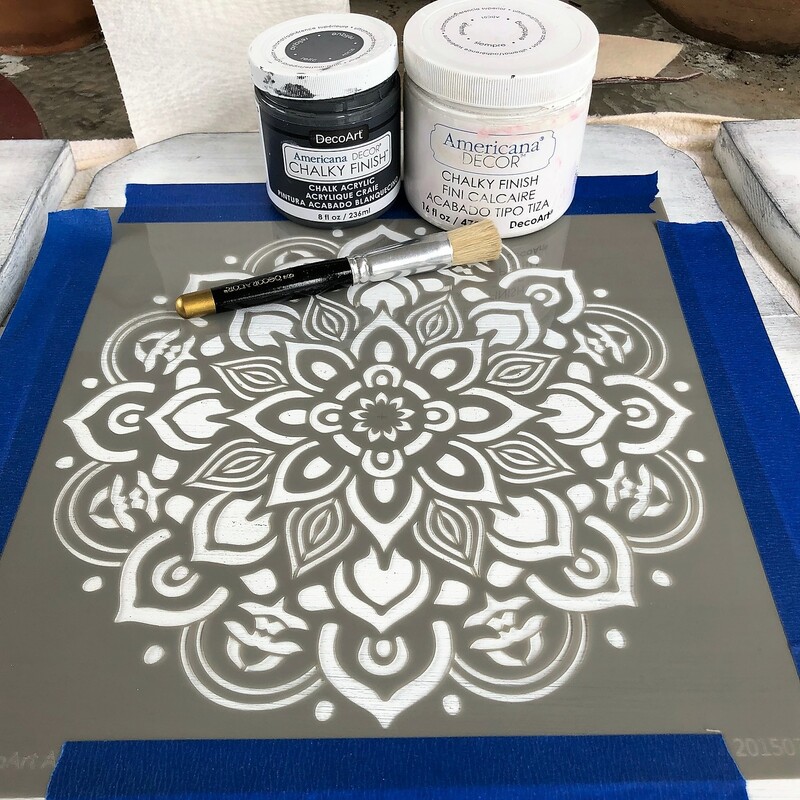 After it dried, I brushed a coat of DecoArt Americana Decor Everlasting Chalk Paint over it and let it dry. Next I randomly sanded the edges of the chair and some of the surface. 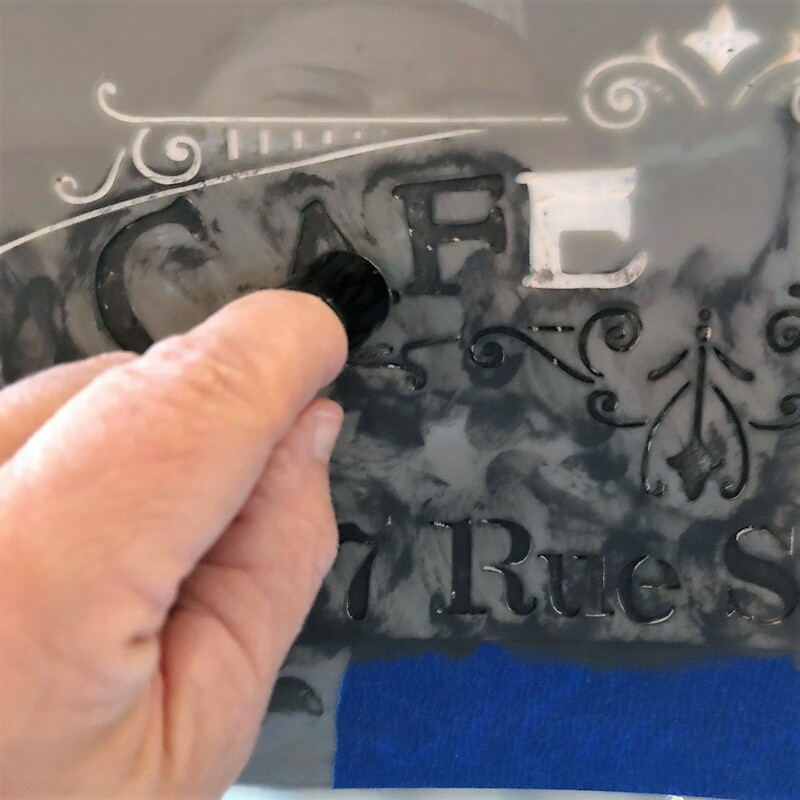 The grey began to peek out from underneath and I loved the weathered, peeled paint look I was getting. 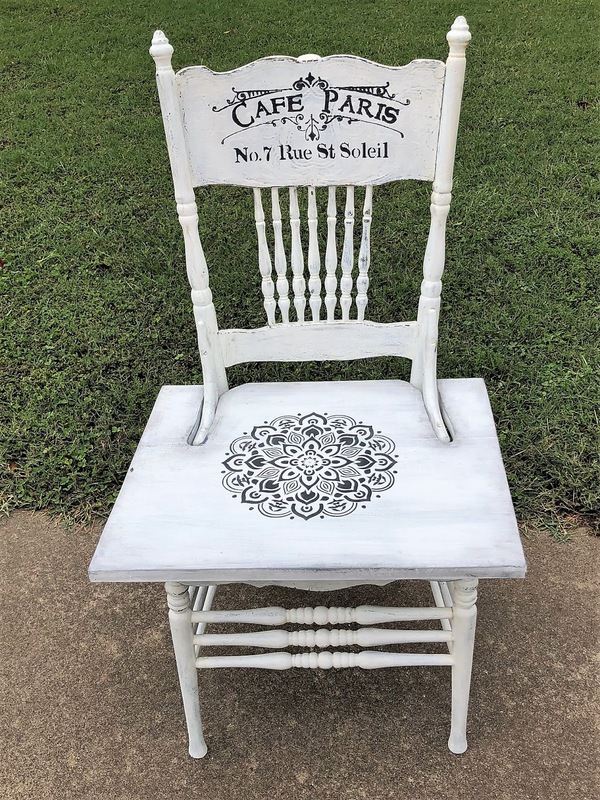 Next I attached DecoArt's large 12 x 12 Cafe Paris Stencil to the center of the back of the chair and using the Relique Chalk Paint, I stenciled a portion of the design to the chair back. So far, so good! I was loving this new "vintage farmhouse" look. I measured an area for a table or plant stand top and glued three pieces of birch wood together. Then I had my son saw cut them for me and router out where that original supports of the chair were. I painted this table/planter base the same way I did the chair; sanding and allowing the grey to peek out from underneath. 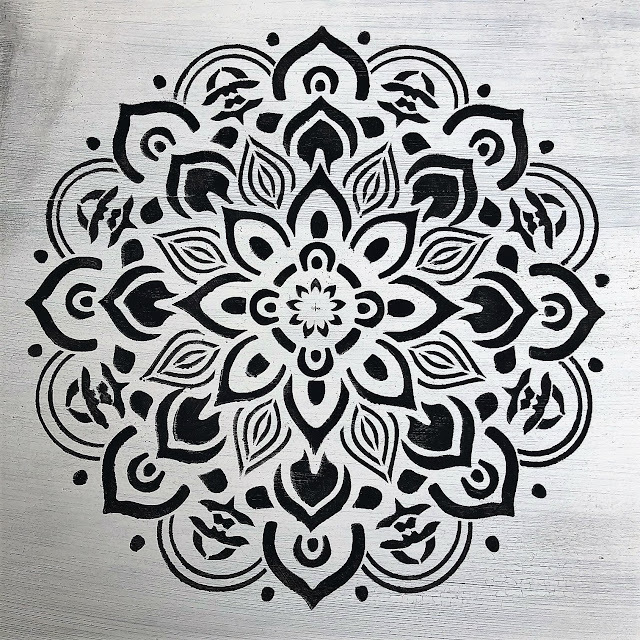 Next I placed my next DecoArt Americana Mandala 12 x 12 Stencil in the center of the top and taped it in place using painter's tape. 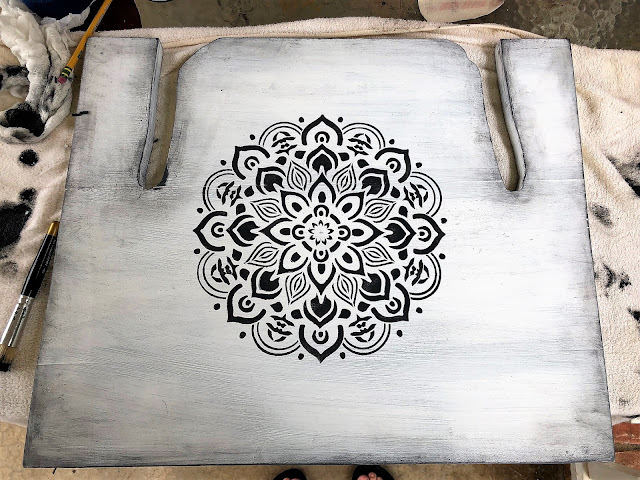 Just as I had done on the back of the chair, I used the Relique Chalk Paint to stencil this fabulous design on the table/planter top. Isn't this just a gorgeous design? And look at the crackled, sanded surface of the paint below! I love it! I then wiped some extra of the Relique Chalk Paint around the edges random surface to add to the charm and "age" of the table/planter top. I slid the table/planter bottom in place and "whalah!" my old, ratty chair was looking pretty proud and stylish once again! I sprayed a clear matte sealer all over the chair (2 coats) to protect it. This may end up on my front porch or back patio garden area when the weather is permitting. Otherwise it will be in my art studio where I can enjoy it. I've already got some plants sitting on it and I love the very sweet, homespun feeling I get from this chair! Thanks for stopping by. This is just a reminder that even old "junk" can be given a new, useful purpose if you just think about it and let your imagination take over. Labels: DecoArt Americana Chalk Paint, DecoArt Americana Stencils, Repurposed Vintage Chair, Vintage Farmhouse Repurposed Chair. What a transformation! 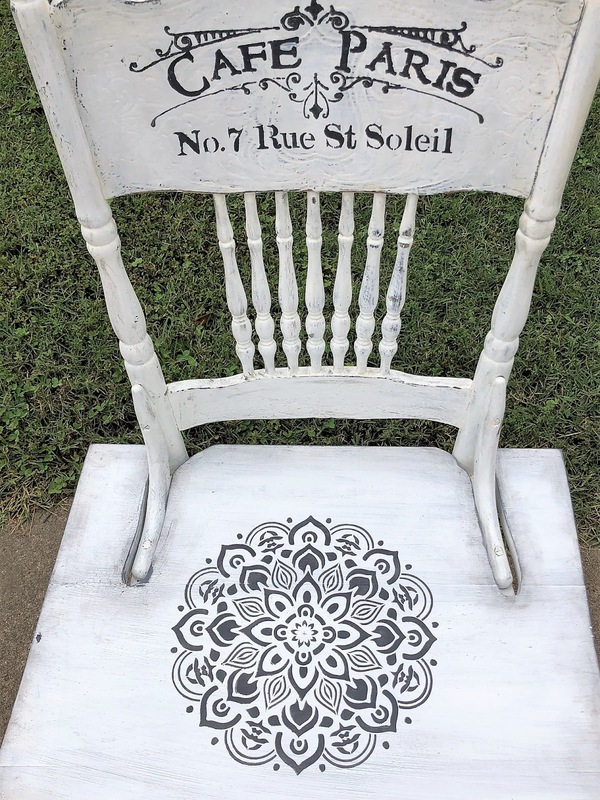 LOVE the stenciling and the larger seat...so cool!